The 10 Best Taco Places in Oregon! If your stomach is rumbling for a delicious taco with all your favorite toppings, Oregon’s many taco places can help happily fill your belly! At these great spots, you can pair an authentic, flavorful taco with ideal ambiance and maybe a margarita or two. Here are the 10 best taco places in the state! Once you’ve had the house-made flour tortillas from Stella Taco, you’ll never be able to go back to the store-bought variety again. This tiny taco shop has two Portland locations, and any time you think tacos are for lunch and dinner only, think again. Stella Taco’s brisket and egg or bacon and egg taco will have you thinking about breakfast in a whole different way. San Francisco’s Mission District’s iconic burritos provided the inspiration for Tigard’s Taco de Sol—Tigard residents consider Taco Del Sol’s breakfast burritos to be the best in the Pacific Northwest. All items here are fresh and authentic. 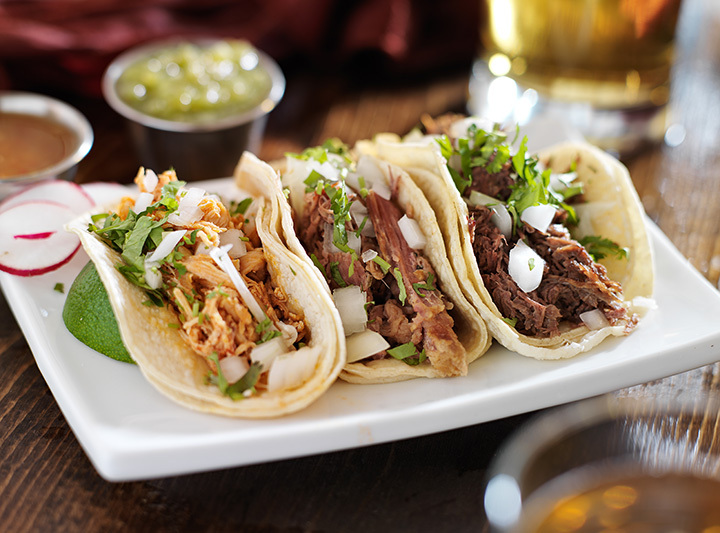 Try the street taco specials for a filling meal for under $5. Happy Hour is ever day from 2 p.m. until 5 p.m. Colorful, traditional decor provides guests with a visual taste of Old Mexico as they enjoy Jalisco-style cuisine prepared with fresh, locally sourced ingredients, including free-ranging meat. La Hacienda Real boasts the biggest Mexican beer selection in Salem. A classic taco joint with counter service, draft beer, and margaritas, Tacovore serves up super tasty tacos in a casual, fun atmosphere. The margaritas are made with freshly squeezed lime juice and the tacos are creative and unique. You can’t have too many taco joints in a university town. Eugene’s Taqueria Mi Tierra specializes in down-home Mexican cuisine served with the kind of warmth only found in family owned and operated restaurants. You’ll find old family residents made with fresh ingredients served in a homey atmosphere. Lucky Bend residents and visitors can have amazing tacos every day of the week now that Tacos Pihuamo is in town. The service is friendly and the food is hot and fresh. Locals say to try the pork with red sauce taco for a taste experience you won’t forget. You’ll also find reasonable prices in a town known for being a bit on the high side when it comes to the cost of eating out. Baker City residents and guests enjoy freshly made tacos with super friendly service at D & J Taco Shop. Conveniently located on Baker City’s historic Main Street, you have the option of dining inside, at a table on the patio, or picking up lunch or dinner for the family and taking it home. Don’t forget to stop by on Friday for D & J’s extra special fish tacos. Great place to grab a quick bite when you need something fast but don’t want to go to yet another fast food place with flat, tasteless fare. The food here is traditional, and the service is friendly. There’s no inside seating here, but tacos, like all most other food, taste better when enjoyed in the fresh air anyway. Residents and those just passing through the little mountain town of Oakridge have been going to Mazatlan for years. The warm, colorful interior features wall murals of life in Old Mexico, and it’s easy to tell that the staff is all family. You can get your food to go at Mazatlan, but dining in-house is a delightful experience that you shouldn’t miss. Lincoln City’s La Roca offers fast fare that’s consistently good no matter when you pay them a visit. The chips are always fresh and hot, and the portions are large enough to fuel an active day on the beach.